FRIDAY NIGHT May 17, 2019 from 6pm-9pm is EARLY BIRD SHOPPING! Purchase online tickets get you EARLY BIRDS in at 5:30pm instead of 6pm and admission for Saturday too! just another reason to buy online! We have gone to e-Tickets.. no more waiting for snail mail! Buy early! There are only a limited amount to be sold online. You can purchase tickets here..
Saturday, May 18, 2019 General public admission will go on sale at 10am at the door. The shopping extravaganza starts at 10am and goes until 4pm for the general public. Admission is $5 at the door on Saturday! FRIDAY NIGHT March 1, 2019 from 6pm-9pm is EARLY BIRD SHOPPING! Saturday, March 2, 2019 Limited amount of online tickets will be available for Saturday admission. (We will have a WILL CALL area to check you in) General public admission will go on sale at 10am at the door. The shopping extravaganza starts at 10am and goes until 4pm for the general public. Admission is $5 at the door on Saturday! FRIDAY NIGHT February 22, 2019 from 6pm-9pm is EARLY BIRD SHOPPING! Saturday, February 23, 2019 Limited amount of online tickets will be available for Saturday admission. (We will have a WILL CALL area to check you in) General public admission will go on sale at 10am at the door. The shopping extravaganza starts at 10am and goes until 4pm for the general public. Admission is $5 at the door on Saturday! FRIDAY NIGHT FEBRUARY 1, 2019 from 6pm-9pm is EARLY BIRD SHOPPING! Saturday, February 2, 2019 General public admission will go on sale at 10am at the door. The shopping extravaganza starts at 10am and goes until 4pm for the general public. Admission is $5 at the door on Saturday! FRIDAY NIGHT November 16, 2018 from 6pm-9pm is EARLY BIRD SHOPPING! Saturday, November 17, 2018 General public admission will go on sale at 10am at the door. The shopping extravaganza starts at 10am and goes until 4pm for the general public. Admission is $5 at the door on Saturday! Rebel Junk (formerly Junk Salvation) is brought to you by Dixie DeRocher of the Funky Junk Sisters! Yes, this is an ORIGINAL Funky Junk Sisters show. 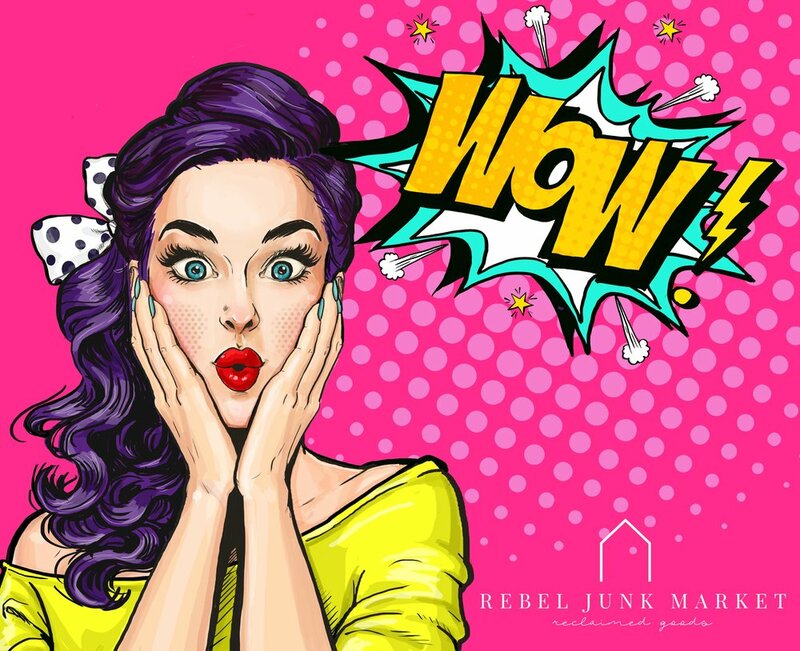 We are SO excited to bring a fabulous and fun filled VINTAGE MARKET to ROCK SPRINGS, WYOMING! We are heading back to WYOMING! This is a Friday Night and Saturday shopping extravaganza! We promise you can find some of the most unique vintage items under the Wyoming sky! SAVE THE DATES! October 26th & 27th! Friday Night. October 26thth from 6pm-9pm is EARLY BIRD SHOPPING! Tickets are $10 online! http://rebeljunk.com/schedule is where you will purchase tickets! They are downloadable so you don't have to wait for them in the mail. Saturday, October 27th, , the shopping extravaganza starts at 10am and goes until 4pm for the general public. Admission is $5 at the door on Saturday! 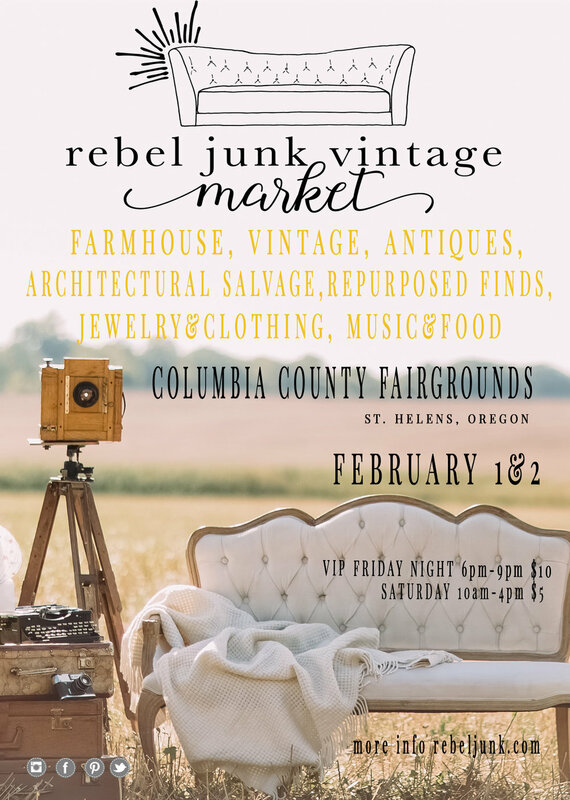 Voted as a top Traveling Vintage Market in the US by Flea Market Style Magazine, Top 25 Flea Markets in America by Romantic Homes Magazine and a MUST attend Flea Market in America by Flea Market Decor Magazine, the Rebel Junk Vintage Market by Dixie DeRocher is coming to Tacoma! Rebel JuNK Market Lebanon, Tennessee! SAVE THE DATES! February 23 & 24, 2018. Friday Night. February 23th from 6pm-9pm is EARLY BIRD SHOPPING! Saturday, February 24th, 2018, the shopping extravaganza starts at 10am and goes until 4pm for the general public. Admission is $7 at the door on Saturday! Janna Allbritton of Yellow Prairie Interior Design will be our special guest on Friday night for a very prairie CHRISTMAS decorating workshop! To purchase tickets to this workshop which includes admission to the market and the workshop click on the button below. Tickets for this portion of the event is $25! FRIDAY NIGHT November 10th, 2017 from 6pm-9pm is EARLY BIRD SHOPPING! Saturday, November 11th, 2017. Limited amount of online tickets will be available for Saturday admission. (We will have a WILL CALL area to check you in) General public admission will go on sale at 10am at the door. The shopping extravaganza starts at 10am and goes until 4pm for the general public. Admission is $7 at the door on Saturday! SAVE THE DATES! October 27 & 28, 2017. Friday Night October 27th from 6pm-9pm is EARLY BIRD SHOPPING! Saturday, October 28th, the shopping extravaganza starts at 10am and goes until 4pm for the general public. Admission is $7 at the door on Saturday! It saddens me to let you know we are postponing our Rebel Junk Vintage Market CA that was taking place October 20 & 21, 2017 at the Napa Valley Expo. The venue is being used to help CALFire in their efforts to fight the fires. Our hearts and prayers go out to all who are affected. Many of our vendors are local and have been in dismay about what to do. Many are helping where they can... opening up their homes or properties to help the ones who were displaced. Bringing supplies to people who are helping others fight the fires. Helping cook for the thousands who are fighting the fires. This is our JUNKING community! I am reaching out to all the customers who have purchased tickets for the event next week... Please contact me if you would like to donate your purchase to a charity or business who is helping with the efforts. I will match 50%! Every $10 I will donate $5. or let me know you would like a refund. We might not live there but our hearts and prayers are! Rebel Junk (formerly Junk Salvation) is brought to you by Dixie DeRocher of the Funky Junk Sisters! Yes, this is an ORIGINAL Funky Junk Sisters show! We are SO excited to bring a fabulous and fun filled VINTAGE MARKET to NAPA VALLEY, CALIFORNIA! SAVE THE DATES! October 20 & 21, 2017. Friday Night. October 20th from 6pm-9pm is EARLY BIRD SHOPPING! Tickets are $15 online! Available online until October 19th or until SOLD OUT! Online tickets get you EARLY BIRDS in at 5:30pm instead of 6pm and admission for Saturday too! Just another reason to buy online! Saturday, October 21, 2017, the shopping extravaganza starts at 10am and goes until 4pm for the general public. Admission is $7 at the door on Saturday! WE ARE HEADING BACK TO WASHINGTON STATE! MANY OF YOU HAVE REQUESTED US TO BRING OUR MARKET BACK TO WESTERN WASHINGTON. WE HAVE LISTENED AND ADDED TACOMA, WASHINGTON TO OUR LIST OF CITIES! SEPTEMBER 23, 2017 WE WILL BE AT THE TACOMA DOME FOR A ONE DAY SALE! TICKETS ARE AVAILABLETHROUGH TICKET MASTER! THIS WON'T BE YOUR AVERAGE REBEL JUNK MARKET?! WE ARE TRYING SOMETHING NEW AND ADDING "CRAFTED" TO THE MIX. WHATS CRAFTED?! WELL, PRETTY MUCH EVERYTHING YOU SEE ON INSTAGRAM AND PINTEREST. IT WILL BE FROM UP-CYCLED, RESTYLED, RE-PURPOSED... EVERYTHING TRENDY! WE WILL HAVE VINTAGE, FARMHOUSE, RUSTY JUNK TOO! AFTER ALL WE ARE STILL A JUNK MARKET! THIS ONE DAY SALE WILL BE JUST THAT! EARLY BIRD BUYING STARTS AT 9AM $15 PRESALE AND AT THE DOOR. 10AM IS GENERAL ADMISSION $7 PRESALE AND AT THE DOOR. ALL THE FESTIVITIES END AT 4PM! OH... AND I HAVE MADE ARRANGEMENTS FOR FREE PARKING! I JUST HATE HAVING TO PAY TO PARK... WHAT ABOUT YOU? MAKE A DAY OUT OF IT! THERE WILL BE FOOD, MUSIC AND JUNK... WHAT MORE CAN YOU ASK FOR?! NOW FOR THE FUN PART! CALLING ALL CREATIVE PEOPLE... JOIN US AS A VENDOR! IT IS A JURIED EVENT, HOWEVER, YOU JUST MIGHT BE ABLE TO JOIN US IF YOUR "CRAFTED" IS WHAT WE ARE LOOKING FOR.. SO GIVE US A TRY! YOU JUST NEVER KNOW.. WE JUST MIGHT SURPRISE YOU!! THE APPLICATION IS UP ON THE WEBSITE... GO HERE! 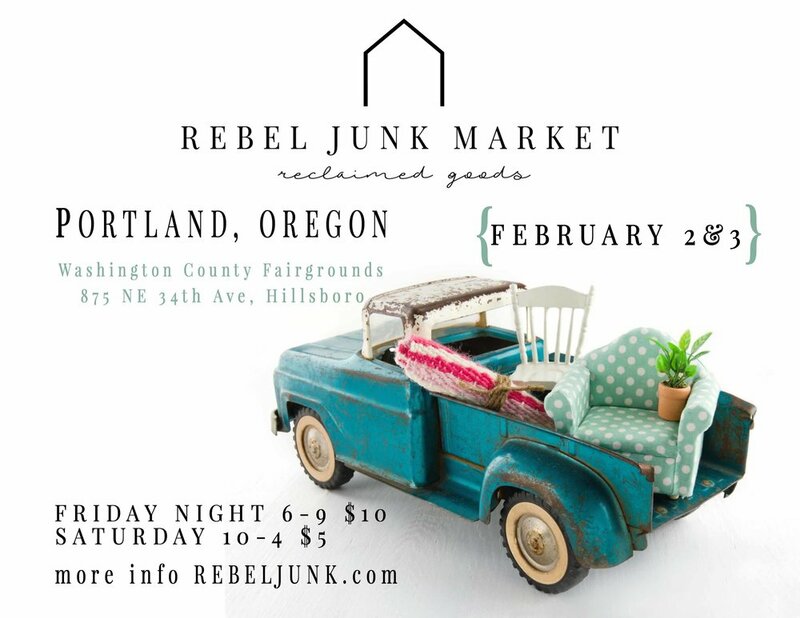 JOIN US FOR SOME GOOD OL' JUNKIN FUN! SAVE THE DATES! May 19 & 20, 2017. Friday Night. May 19th from 6pm-9pm is EARLY BIRD SHOPPING! Tickets are $15 online! http://rebeljunk.com/schedule is where you will purchase tickets! They are downloadable so you don't have to wait for them in the mail. Saturday, May 20th, the shopping extravaganza starts at 10am and goes until 4pm for the general public. Admission is $7 at the door on Saturday! Rebel Junk (formerly Junk Salvation) is brought to you by Dixie DeRocher of the Funky Junk Sisters! Yes, this is an ORIGINAL Funky Junk Sisters show! 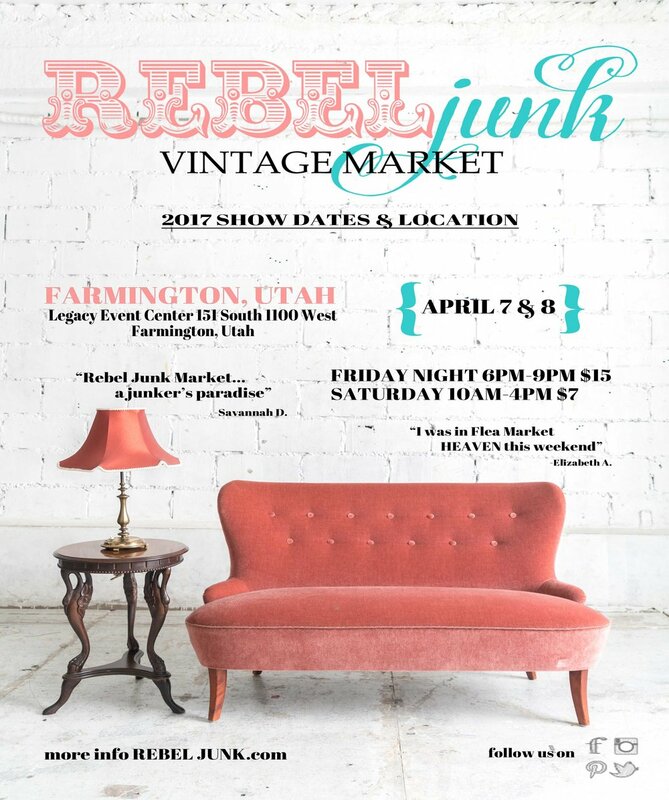 We are SO excited to bring a fabulous and fun filled VINTAGE MARKET to FARMINGTON, UTAH! That's right! We are going to UTAH!!! We have been voted TOP TRAVELING VINTAGE MARKET in the USA by FLEA MARKET STYLE magazine! Named one of the TOP 25 Flea Markets in America by Romantic Homes Magazine! Listed as a MUST attend Flea Market in America by Flea Market Decor magazine! This is a Friday Night and Saturday shopping extravaganza! We promise you can find some of the most unique vintage items under the UTAH sky! SAVE THE DATES! April 7 & 8, 2017. Friday Night. April 7th from 6pm-9pm is EARLY BIRD SHOPPING! Tickets will be available at the door for $15 for Friday Night Early Buying! They go on sale at 6pm. These tickets will get you in both days! Saturday, April 8, the shopping extravaganza starts at 10am and goes until 4pm for the general public. Admission is $7 at the door on Saturday! SAVE THE DATES! March 31 & April 1, 2017. Friday Night. March 31st from 6pm-9pm is EARLY BIRD SHOPPING! Online tickets get you EARLY BIRDS in at 5:30pm instead of 6pm and admission for Saturday too! Just another reason to buy online! We have gone to eTickets... so you don'tneed to wait for the snail mail for these bad boys! Buy early! There are only a limited amount to be sold online. You can purchase tickets here... schedule! Saturday, April 1st, 2017, the shopping extravaganza starts at 10am and goes until 4pm for the general public. Admission is $7 at the door on Saturday! Rebel Junk (formerly Junk Salvation) is brought to you by Dixie DeRocher of the Funky Junk Sisters! Yes, this is an ORIGINAL Funky Junk Sisters show! 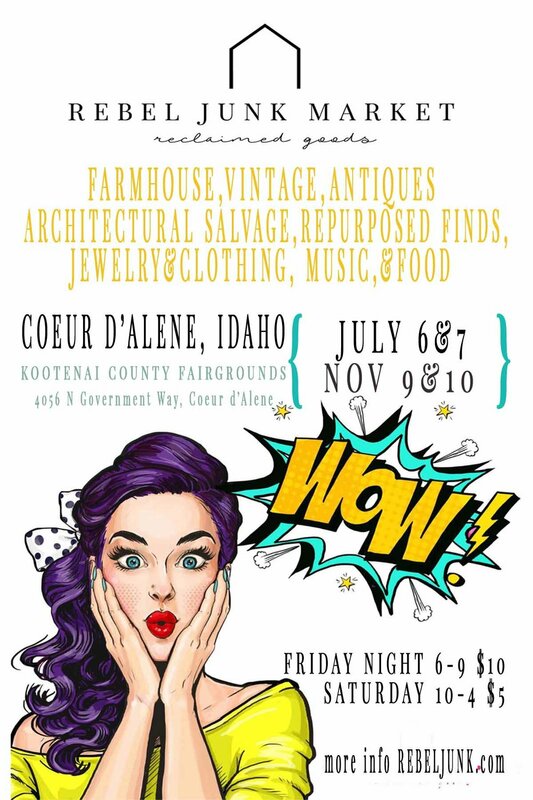 We are SO excited to bring back our fabulous and fun filled MARKET to COEUR D'ALENE, IDAHO! SAVE THE DATES! March 24 & 25, 2017. Friday Night. March 24th from 6pm-9pm is EARLY BIRD SHOPPING! Tickets are $15 online! Available online until March 15th or until SOLD OUT! Online tickets get you EARLY BIRDS in at 5:30pm instead of 6pm! Just another reason to buy online! We have gone to eTickets.. no more waiting for the snail mail! Saturday, March 25, 2017, General public admission will go on sale at 10am at the door. The shopping extravaganza starts at 10am and goes until 4pm for the general public. We do have a limited amount available online to help with the lines. We will have a WILL CALL area to check in. Admission is $7 at the door on Saturday! Online tickets get you EARLY BIRDS in at 5:30pm instead of 6pm! Just another reason to buy online! We have upgraded to e-Tickets! You don't have to wait for snail mail.